Last year all of the technological pieces fell into place for Ron McGehee and his son Clark. Together the duo launched WaneShear Technologies LLC, manufacturing the unique WaneShear lumber-cutting system in a new shop located in Ukiah, CA. WaneShear’s Omax 120X-3 JetMachining Center features an x-y cutting travel of 40 by 10 ft. Its DualBridge setup is a configuration option that allows the addition of a second Y-bridge to boost efficiency and flexibility. The bridges can be programmed to produce separate components or can work in tandem to cut one large part. Unlike regular sawmill edgers that move rough lumber into stationary saws, the WaneShear, says Clark McGehee, who serves as the plant’s general manager, passes saw blades through lumber as it remains stationary. The result is what may be the fastest system of its kind, capable of processing as many as 60 board/min.–17,000 boards/shift. And, it does so at a cut accuracy within 0.015 in. The WaneShear system gets its name from “wane”—the round exterior portions of logs that cannot be cut into square lumber. The WaneShear shears off a log’s wane. The boards are scanned, positioned and cut transversely. Since the board never changes directions, as with conventional systems, the Wane-Shear takes up the space needed for only one lumber line. The system uses all electric actuators, ensuring accuracy, speed and efficiency. A complete WaneShear system, while also much more compact than other sawmill edgers, can measure up to 80 ft. long and 45 ft. wide. Manufacturing the systems requires WaneShear Technologies to fabricate, machine and assemble several hundred components, primarily of mild and Type 4140 steel, as well as aluminum and other materials such as fiber felt and Delrin (a thermoplastic). Part thickness ranges from 0.250 to 1.5 in. ; parts can be as small as 1 by 1 by 1 in. or as large as 8 ft. wide by 36 ft. long. For processing many of its parts, WaneShear Technologies first considered laser cutting. However, a machine capable of handling the shop’s range of material thicknesses, in particular 1.25-in.-thick aluminum, would have been very expensive—not to mention the challenge of cutting non-metallic materials. Enter abrasive-waterjet cutting. For tapped holes (top), the 120X-3, says Clark McGehee, WaneShear general manager, cuts holes to tolerances tight enough to allow tapping without having to be drilled to size. The shop then quickly and easily taps the holes using a magnetic-base drill. Also, the speed and accuracy delivered by the waterjet-cutting machine allows WaneShear to design its parts with features that help streamline the shop’s welding operations. For example, mating parts (bottom) include waterjet-cut slots and keys to enable quick and easy weld fitup. With an abrasive-waterjet system, the 12-person shop easily processes all of its metallic work, and other materials. Additionally, its cutting machine (a JetMachining Center from Omax) helps reduce the amount of machining done on the shop’s conventional CNC machine tools. This allows WaneShear to streamline its welding and fabrication operations and cost-effectively increase production of its lower- and higher-volume parts. WaneShear’s Omax 120X-3 JetMachining Center features an x-y cutting travel of 40 by 10 ft. Its DualBridge setup is a configuration option that allows the addition of a second Y-bridge to boost efficiency and flexibility. The setup, which can be added to any new or existing JetMachining center, allows two Y-bridges to work independently, significantly increasing machine capacity. The bridges can be programmed to produce separate components or can work in tandem to cut one large part. The system also boosts machine-utilization rates, as cutting can be performed while materials are loaded and unloaded from the machine. 1-in.-thick Type 4140 steel, which can take several hours, the machine’s second bridge works on other shorter-run parts. Or, one bridge will be used for cutting higher-volume parts and the other for different individual parts in batch sizes of one or two. WaneShear also specified its cutting machine with the Omax 50-hp Dual Pump package, an integrated system that utilizes two P4055V pumps, designed for shops with high-capacity production demands to cut thick materials and using multiple nozzles. Additionally, the 120X-3 features Omax’s Collision Sensing Terrain Follower accessory that automatically adjusts the machine’s nozzles for collision avoidance; and the Tilt-A-Jet that eliminates practically all taper along part cut walls. Tilt-A-Jet positions the cutting nozzle at an angle (± 9 deg. max.) calculated by the process software to offset the taper from the abrasive waterjet. The taper then moves to the scrap, leaving part edges nice and square. According to Clark McGehee, most of the parts cut on its new machine are ready to be assembled—no need for secondary operations, a tremendous time saver. 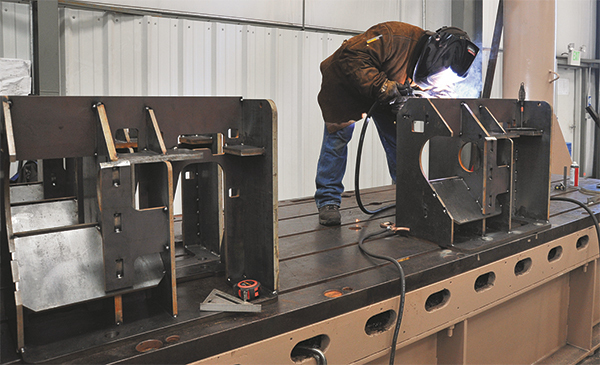 A WaneShear welder assembles components of the firm’s unique lumber-cutting system. Part thickness ranges from 0.250 to 1.5 in. ; parts can be as small as 1 by 1 by 1 in. or as large as 8 ft. wide by 36 ft. long. Two examples where the waterjet-cutting machine eliminates subsequent machining operations involve parts needing flange bearings and those requiring tapped holes. 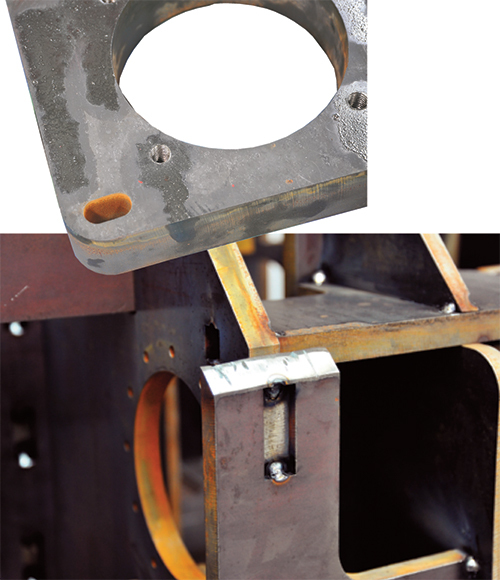 WaneShear uses several piloted flange bearings in its edging system. Rather than flame-cut and bore the parts to prepare for the bearings, the shop accurately waterjet-cuts the required features to the size and straightness needed for inserting the bearings as the parts exit the waterjet machine. No additional machining is needed. For tapped holes, the 120X-3, says McGehee, cuts holes to tolerances tight enough to allow tapping without having to be drilled to size. The shop then quickly and easily taps the holes using a magnetic-base drill. Intelli-Etch, part of the Omax Intelli-Max software suite that also includes programming to optimize cornering and piercing and to control taper, allows a user to recreate images on the surface of the workpiece. The software converts an image’s brightness levels into machine speeds, allowing the waterjet to etch an image from a standard bitmap file into the material. The speed and accuracy delivered by the waterjet-cutting machine allows WaneShear to design its parts with features that help streamline the shop’s welding operations. For example, mating parts include waterjet-cut slots and keys to enable quick and easy weld fitup. For the shop, cutting these extra features on any other machine could prove cost- and time-prohibitive. These fabrication features, notes McGehee, do not completely eliminate the need for welding fixtures. Some fixtures are required to keep parts square and plumb. However, custom fixturing is unnecessary, and most of the time the shop’s welders simply need only a flat table surface. 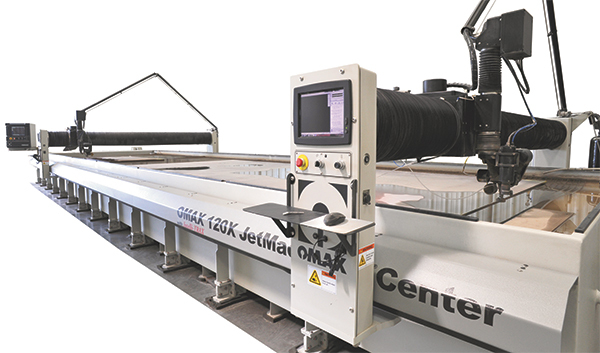 As a critical tool in the shop’s manufacturing operations, the waterjet-cutting machine typically runs from 6:30 a.m. to 11 p.m. six days per week in the WaneShear plant. It occasionally operates in continuous production for as long as 48 hours, uninterrupted. From start to finish, it takes the shop about six months to build one Wane-Shear; annual build capacity is four systems. But as the shop ramps up production, it expects production time per unit to drop significantly. To shorten lead time, the firm has begun to structure operations to allow simultaneous production of two WaneShear systems. As a result, the waterjet-cutting machine now cuts two of every part, with the extra parts used to build the next system. “The machine’s speed is what allows us to do this, without adding a significant amount of time to production,” says McGehee. Article provided by Omax Corp., Kent, WA: 253/872-2300; www.omax.com.